If you've ever shopped around for car insurance, there's one thing you may already realize: Calculating rates is not an exact science. This is why you can get relatively different quotes from different insurers. It's also why you should shop around. That said, your rate is also affected by a variety of factors — some of which you can control, and some of which you can't. You probably already know that factors like your gender, age, and driving record affect your auto insurance rates, so we reached out to a few experts to find out what other, lesser-known factors can affect your premiums. Here are a few. You can probably guess that if you drive a $100,000 sports car, you're going to have very high insurance rates. 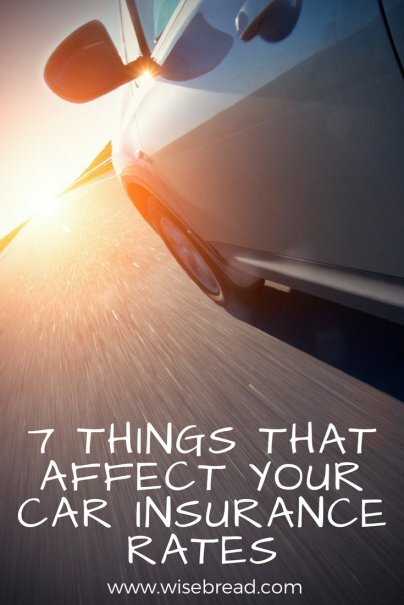 But there are a lot of other common details about your car that could affect your insurance rates. According to Mark Nicholson, marketing director at auto marketing company Absolute Results Productions Ltd., these include the safety rating of your vehicle, its size and age, and even the likelihood that it might be stolen. "Another factor some providers use is how much horsepower your engine has, because by their logic, it suggests that you're more likely to drive fast and are at greater risk of getting into an accident," Nicholson says. This is why when you're buying a new car, it's a good idea to call for insurance quotes before you actually make your final purchase decision. If the new car you choose is considerably faster or sportier than the one you're driving now, that'll be reflected in a higher insurance rate. For example, if you're considering a 4x4 SUV, you need to consider that a factor as well. "Even if 90 percent of 4x4 SUVs will never be driven off-road, the insurance company will assume you'll want to take the occasional trek up a mountainside or fly down that dirt path through the woods. That's a higher risk, and you'll pay more for it," says Chris Burdick of Automoblog.net. Even if you opt for a super-practical family sedan, you still might get stuck with high insurance premiums. "You'd think that the more common the car, the less insurance will be, but that's not always the case," Burdick says. "For example, if you own a Honda Accord, it's considered to be one of the most stolen cars in the U.S. Same with the Honda Civic, Nissan Altima, Chevy Impala, and Toyota Camry. If you own a car that's stolen frequently, your insurance company will find that to be a higher risk and your insurance rates will go up accordingly." Yup, they're watching you. In fact, your insurance company probably uses quite a few facts about you — both basic and personal — to calculate your car insurance rate. Some of the most common factors that will count against you and raise your rate include being under 25, being male, and having a poor credit score. "We can see a difference in rate of 100 percent or more in premium increase for someone with poor credit," says Joe Espenschied, agency principal and owner at Insurance Brokers Group. "When we have a quote for someone with a clean driving history — but a very high insurance premium — it's due to credit." At least credit (unlike age and gender) is a factor you can control. But there are other interesting details about your life that could impact your premium, too. Sophia Borghese, a consultant for Superior Honda in Louisiana, says that being a homeowner can impact your insurance rate, much like your credit score. "Homeowners are lucky. It's thought that they do not have as many financial issues as renters. Because of this, insurance companies trust and reward them by not giving them the burden of high rates," Borghese says. Another personal detail many insurers consider is your marital status. Some insurers see married drivers as being more responsible than single ones. In fact, a 2004 study by the National Institutes of Health and reported on by DMV.org found that singles were twice as likely as married people to get into automobile accidents. "The amount by which your rates drop can vary greatly based on your other circumstances, although men's rates tend to drop more than women's when they get married," says Steve Pritchard, founder of insurance comparison site Cuuver. "However, those who have a driving history free of accidents, and a clean driving record before getting married, could see their rates reduced by almost half of what they were paying before they tied the knot." There's one more personal wild-card that could have an impact on your premium: your job. According to The Zebra's 2018 State of Auto Insurance Report, drivers with full-time jobs will save about $30 on car insurance over those who are unemployed, while active duty military and veterans will get a discount of about $50 over civilians. If you use your vehicle for work, you can also expect to see your rates go up. We all know that our driving records affect our insurance rates, but there are lots of other components of how and where you drive that can affect premiums as well. Where you live and drive is also scored according to cases of vandalism, the number of claims and fraudulent claims in that area, cases of vehicle theft, and the occurrence of damaging weather, such as flooding or hurricanes. But insurance providers are also moving beyond statistics and data about your past behavior to provide insurance based on how you are actually driving day to day. This involves installing what's called a usage-based insurance device into your car, which tracks your driving behavior. "If you practice safe driving habits, don't frequently drive between 12:00 and 2 a.m., or use lots of high-traffic routes, you could qualify for up to a 30 percent decrease in insurance rates," says Anna Drake, the insurance producer at Insurance Shop LLC. Of course, if your driving habits are less than stellar, this type of policy could also drive your rates upward. 7. And then there's the "secret sauce"
While most insurance companies use some combination of the same or similar factors to calculate your insurance rate, there's no standard calculation. "Each company compiles its own factors to find its own 'secret sauce' or 'ideal insured.' When the individual hits a company's sweet spot, it will reflect in pricing and coverage," says Janine Fixmer, an independent insurance agent at Agency Insurance LLC.